Keeping your home warm, your water hot, and your food cooking is what our home LPG service is all about. LPG is the cleanest burning, lowest emission fossil fuel, and Rockgas North combines the highest quality LPG with reliable, friendly service, delivering on time, every time. We ensure your gas never runs out – and if it does, well, we’re only a phone call away to book your gas bottle refill. We offer you three easy methods to manage your LPG supply, with an online ordering system, an easy-to-use app, and of course our friendly on-call customer team! We’re happy to assist you in any way we can, from advice through to delivery, installation and maintenance – we’re here to help. Whatever your signature dish, you’ll love creating it with the help of gas. Cooking over a gas flame gives you instant heat and precise temperature control – it’s the perfect way to cook! You’ll find that cooking with gas offers superior results in every sense. 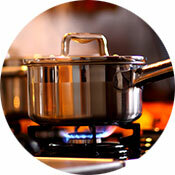 Instant heat, far superior temperature control, and even heat distribution are all benefits of cooking with gas. Gas cooktops are relatively easy to install, and are available either free-standing or built in, so you can upgrade to a gas cooktop without the need to remodel your entire kitchen! Contact the team at Rockgas North for more information. An instant gas hot water system is a great alternative to traditional electric or gas-fired cylinders. Modern gas hot water systems offer luxurious hot water that won’t run out – because it’s heated as you use it. There are other advantages too – the equipment can be mounted outside to save space, and your energy bill will reflect the fact that you only pay for the water you use, not a drop more. Heating your home water supply with gas is easy and efficient, and you will notice an immediate difference in the speed of water heating, with gas water heating instantly upon ignition! You will also notice that your supply of hot water will increase, as you will no longer be constrained by the size of your hot water cylinder. Never again will you hear the shouts of dismay from your husband or children (or yourself for that matter!) when your shower suddenly runs cold – with gas-heated water, you can be sure of a continuous, instant supply of hot water when you need it the most. Gas heated homes are warm and welcoming. While wood fires may seem romantic, the reality is that they can take a long time to heat a room, and they can take a lot of effort to maintain and fuel. Likewise, electric heating is an expensive solution which will push your home power bill through the roof! 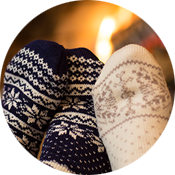 With LPG home heating, you will notice a large reduction on your power bills (especially when combining your power with our LPG gas service; take a look at our range of Home Dualfuel Plans for more information) while enjoying an instantly toasty warm home. Choose from portable gas heating, flued gas heating, and gas fireplace and gas log fire heaters; with thermostat controls, instant ignition, remote controls and timers, gas heating is an attractive and efficient option for heating your home! In summer, there’s just no beating those magic nights on the patio or deck. It only gets better if you are sharing a meal cooked on a barbeque powered by gas. And when the sun finally disappears, why go inside? 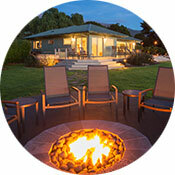 Just fire up the patio heater, brazier or outdoor fireplace and talk long into the night – no effort, no mess, no fuss. Team up your home power and gas accounts with Contact Energy and Contact Rockgas, and save! Our Home DualFuel Plan is designed to save you effort, time and money.